The Elder Scrolls VI is early in development – so early, in fact, that it might just be a handful of words on a whiteboard in the Bethesda office. Nonetheless, the studio is confident enough that they’re working on the next entry in the fantasy series that they went and debuted a teaser trailer at E3. It was maddeningly brief, but it did give us an apparent hint at the new game’s location. Fill the half-decade you’ll be waiting for TES6 with the best RPGs on PC. 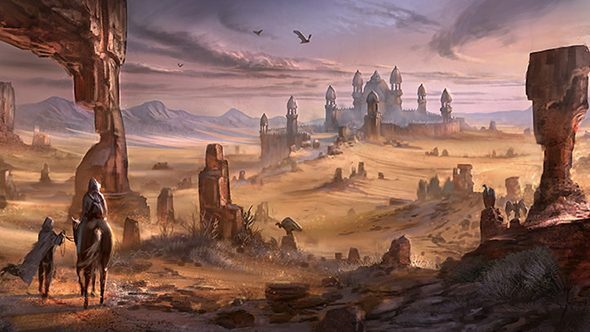 Our best guess for The Elder Scrolls VI setting is Hammerfell, and it seems Eurogamer is on the same track. The publication asked Howard if that was indeed the setting, but he just replied “I’m not going to answer where it’s set!” Damn, Todd, that’s ice cold. Watch that 30 seconds of footage all over again. The next game from Bethesda is heading to space and is pretty futuristic itself –Starfield is slated to be a next-gen game.That means theThe Elder Scrolls VI release dateis going to be even futher out. Still, it’s good to know that there’s at least something concrete put down for TES6.